St Chad, the Apostle of the Midlands, was born in Northumbria, one of four brothers, all of whom became priests. He was educated partly at Lindisfarne under St Aidan and partly in Ireland. He succeeded his brother St Cedd as Abbot of Lastingham in Yorkshire in 664. He became Bishop of Mercia in 669 and Wulfhere, first Christian king of Mercia, gave him land to establish his see at Lichfield. Chad was outstanding for his humility and simplicity of life. He died of the plague on 2 March 672. 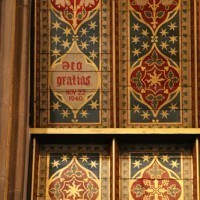 He was at once venerated as a saint and his Shrine in the Cathedral of Lichfield was a place of pilgrimage throughout the Middle Ages. The Shrine of St Chad above the High Altar contains some of his relics which were rescued from Lichfield Cathedral at the reformation. The medieval statue of Our Lady, given by Pugin, and the 15th century canons’ stalls with fascinating misericords. The rood cross, designed by Pugin, with a medieval Flemish figure of Christ. The 16th century statue of St Chad with 19th century carved oak canopy by Joseph Pippett of Hardmans. The 15th century pulpit from Louvain which was given by John, 16th Earl of Shrewsbury. The nave benches, designed in 1940 by G. B. Cox, with carved coats of arms of Popes and bishops. The Immaculate Conception window in the north transept, designed by John Hardman Powell, Pugin’s son-in-law, was made and given by Hardman’s in memory of John Hardman. The monument designed by Pugin to Bishop Thomas Walsh, the founder of St Chad’s. It was an exhibit in the Medieval Court at the Great Exhibition in 1851. An illustrated guide book to the Cathedral is available price £1.00 from the bookstall or can be obtained by post. It costs £1.50. (including postage) from the Cathedral Office.